Naruzy Suicide, leader, singer and guitarist for Japanese glam-punk band Lipstick Killers, released his first solo album in 2002. 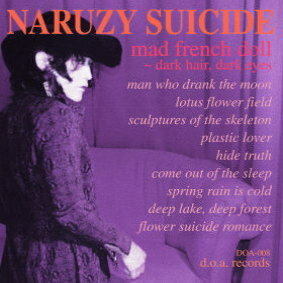 Naruzy is quite a character, his musical influences are firmly rooted in classic glam rock and punk (New York Dolls, Johnny Thunders, The Only Ones, The Dogs D’Amour, Hanoi Rocks, The Suicide Twins etc) with a strong bent towards melancholy, introspection and sad romantic atmospheres and his aesthetics are based on classic decandentism, with artists like Oscar Wilde, Balzac and Baudelaire. The disc is focused on the acoustic, introspective and atmospheric side of Naruzy’s music.He successfully conveys to the listener the darker and more melanchonic side of his art, without being boring or repetetive, thanks to a clever and varied songwriting, without losing any of it’s personality in the process. Naruzy’s guitar playing is simple and unadorned but very effective: the melodies are dreamy, heartfelt and sometimes psychedelic (thanks to a clever use of flanger and delay). His vocals are very peculiar (you’ll hate them or love them, with no shades of grey in between) and, in my opinion, very suitable to the music he’s proposing. The use of female vocals is also very clever, and they help a lot in creating the decadent and sad atmosphere which Naruzy wants to build with his music. The lyrics also are very personal and interesting: the main themes are tragic and broken romantic love stories; remembrances; inner conflict and introspection and the inesorable passage of time and it’s effects. All of the song contained here are originals, with the exceptions of the last two tracks: Flower Suicide Romance originally was written for Naruzy’s first project, named Flower Suicide Romance. It’s a very good song which has the greatest Dogs D’Amour / Tyla influence in the album, while the bonus track Slave of Snakes is an acoustic version of a Lipstick Killers number. This version, in my opinion, is way better than the original. My favourite numbers on the disc are the dreamy Lotus Flower Field, the bluesy and groovy Sculptures of the Skeleton, the robotic and hypnotic Plastic Lover (on which the lead vocals are sung by Yukari, giving a beautiful effect of alienation to the song) and the dramatic Spring Rain is Cold. The only weak number on the album is the sappy Hide Truth, which is too long for it’s own good and hasn’t a clear direction. Overall, a very good and solid album, with a strong personality, a thing that very few acts can claim these days.